Andrew Andy Samberg is an American actor, comedian, singer, writer and producer. He was cast on Saturday Night Live from 2005 to 2012. His friends are his group members and have been credited with popularizing the Saturday Night Live Digital shorts. Samberg has starred in several films including Hot Rod, I Love You, Man, That’s My Boy and Hotel Transylvania. He currently appears in the workplace sitcom Brooklyn Nine-Nine and has won a Golden Globe for best actor in 2014. Samberg was born to Marjorie Margi and Joe on 18 August, 1978 in California. He became interested in creative writing while he was studying in Berkeley High School. He graduated from New York University’s Tisch School of the Arts. He was an avid fan of Saturday Night Live as a child. Samberg first was introduced to the show Saturday Night Live when he was sneaking past his parent’s room to watch professional wrestling on television. His obsession with the show was frustrating even for his teachers as they felt he was distracted by the show. Samberg became a YouTube and internet star with the experimental film and a music video Monkey vs. Robot. Samberg had done his own sketch comedy website TheLonelyIsland.com and became a featured player on the show. Samberg along with his two friends started writing for Saturday Night Live in 2005 and released their debut album Incredibad in 2009. 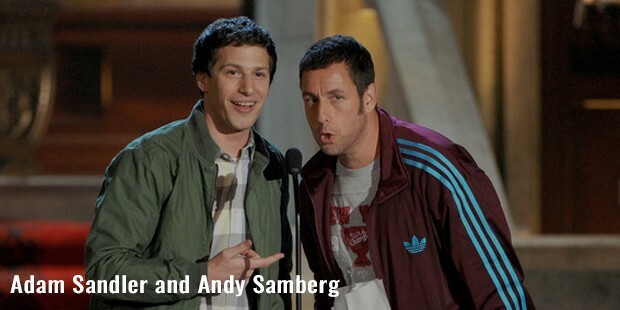 Samberg has worked with Adam Sandler in That’s My Boy and the Hotel Transylvania film series. 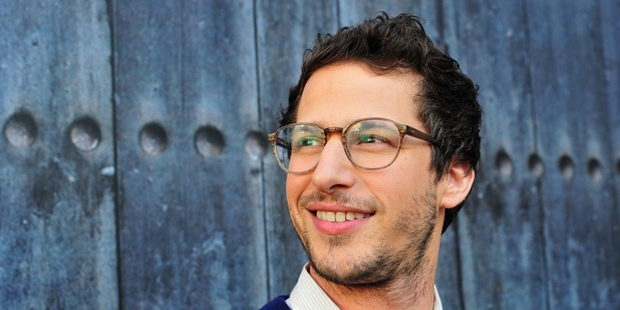 Samberg has also appeared in several theatrical films, commercials, music videos and has hosted events. He has starred in the BBC Three series Cuckoo in 2012 and now plays the role detective Jack Peralta in Fox’s police show Brooklyn Nine-Nine since 2013. Samberg quit the show Saturday Night Live in 2012 but returned to host the Season 39 finale in 2014. 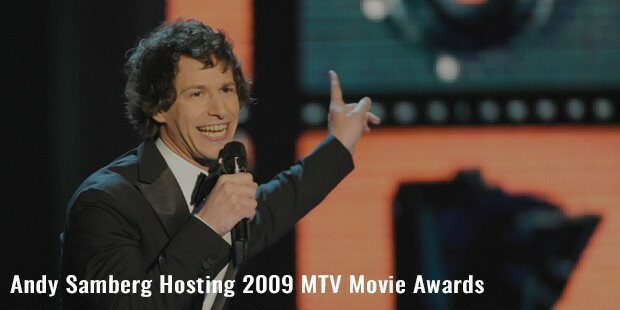 Samberg hosted the 2009 MTV Movie Awards. Samberg has also delivered the Class Day speech at the Harvard University in 2012. 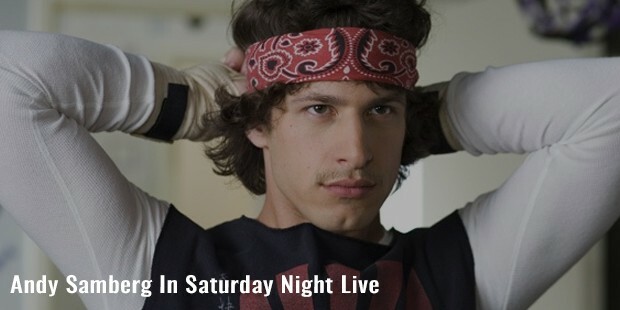 Samberg joined Saturday Night Live in 2005 along with his two friends. The trio’s video collaborated with T-Pain created the musical video I’m on a Boat which had more than 56 million views on YouTube. He has participated in recurring live segments such as Blizzard Man sketch. Samberg dated Joanna Newsom in 2013 after five years of dating. The couple married the same year in September in California. They first met at one of Newsom’s concerts as Samberg describes himself as a superfan of Newsom’s music. Samberg had always had a crush on Newsom even before he has met her through the concert. They purchased the estate Moorcrest in Los Angeles in 2014 which was earlier rented by Charlie Chaplin. Samberg won a Creative Arts Emmy for Outstanding Original Music and Lyrics. His musical video I’m on a Boat in collaboration with T-Pain was nominated for a Grammy Award in 2009. In 2015, Andy Samberg hosted the 67th Emmy’s Award.